As you would expect, there is no straight forward answer to this question, however, we can explore some different scenarios and look at the benefits of triple glazing over double glazing in the three key areas; noise reduction, energy efficiency and security. Ultimately, value for money will have a big influence over the answer! If you have or are looking to install modern double glazing then you will be benefiting from enhanced noise reduction, energy efficiency and security over old double glazing or single pane windows. Modern double glazing is constructed with better sound proof design and materials. Also, the cavity between the glass panels are filled with an inert gas such as Argon, through which sound waves are suppressed. Modern double glazed windows are made with glass that has low emissivity gained from the application of an invisible metal oxide coating that lets heat and light in, but reduces the level of heat and light that can get out. So modern windows have a higher U value which is shown as an energy rating from A to G. If your windows have a high energy rating (A) then you will be able to make more savings with reduced energy bills than you can with lower energy rated windows. Modern double glazing windows have toughened glass, window locks and the frames are generally made from more robust materials than older double glazing. What does triple glazing bring to the party? If you live in an extremely noisy area, every decibel counts, so with enhanced frames, triple glazing can reduce noise a little more than double glazing. As modern double glazing already provides great energy efficiency and noise reduction, triple glazing only makes sense when installed in a new build property that is designed to be low-energy. Triple glazing has a marginally higher U Value, potentially 0.7 compared to the best double glazing that will typically achieve a U value of 1.0. 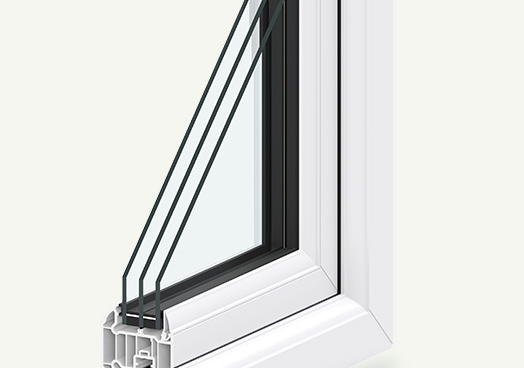 Lower quality double glazing would have a U value of around 2.8 or less. In a very well insulated, low energy house, the difference between triple glazing and good double glazing may count for more. Triple glazing has the same secure fittings and locks as modern double glazing, but with three panes of toughened glass, it can be argued that there is some additional security gained from triple glazing. The benefits gained from triple glazing vs double glazing will be most noticeable in new properties that are purpose-built to high energy efficiency standards. Installing triple glazing will be more expensive but with only a marginal difference in energy efficiency over double glazing. With that in mind, it is fair to say that replacing old windows in a regular property, double glazing provides the best value, giving you more bang for your buck, so in most cases double glazing must be the best option.